The Napa Valley map below this artwork has information about the Napa Valley Wine Train at 1275 McKinstry Street in the City of Napa. Along the southern entrance to Napa Valley is a row of trees next to the Hwy 12 bridge. When I spot those trees I always start feeling relaxed and ready for the fun Napa Valley offers. Usually I don’t go for dark or moody scenes but this one is different. At sunset on a clear day the view from those trees is absolutely glorious. The landscape of the entire north San Francisco Bay unfolds right in front of you. The scene makes me feel good inside and inspires a sense of awe. That is what I see when I look at these trees. While in Napa Valley don't forget to see the Wine Train. The watermark does not appear on the finished print shipped to your home. 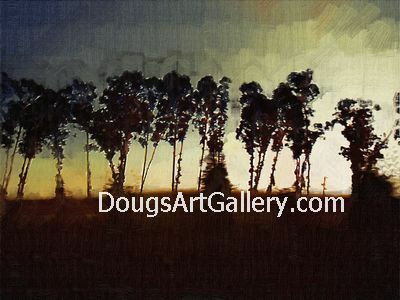 Click here for more purchase information of my artwork. This Napa Valley Winery Map is searchable. Click on the "view larger map" to see restaurants and hundreds more wineries north of the City limit. The artwork above was created near the Merryvale Vineyards just off Hwy 12. Click here to leave Napa Valley Map for more links to artists and their online art galleries, art prints and art posters. Browse the links found at the bottom of Home Page. Do you like this artwork and Napa Valley Map?